"Euro-cool" Package Air Cooled condensing units is available including as standard. Hermatic compressor for R22/R134a/R404a/R507 refrigerants, fitted with sight glass, suction and discharge valve. Crankcase heater, Compressor oil charge. Pressure vessel complete with pressure relief valve 350 Psi. maximum operating pressure. Hi-Low pressure switch automatic reset signal. - Liquid sight glass and filter drier. The Air Cooled Condensing unit (HAM) by ITC features high quality and high efficiency in compare with any other condensing machines. It’s unique and advance technology highly promotes smooth automatic operation. In addition, the unit is capable of heat rejection while keeping the cool air‘s equilibrium inside the refrigeration system. Meanwhile, the heat loads from, for examples, products and machines inside the facility will be expelled by the condensers. Highly Efficient Condenser is attached with fans, which their number depend on the products and heat loads. 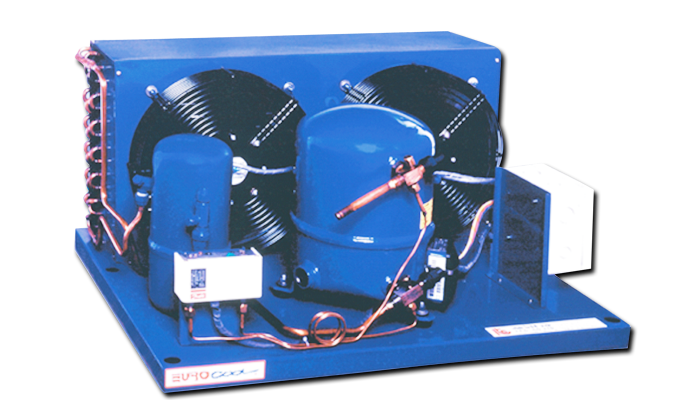 Furthermore, a crankcase heater, compressor oil, sight glass and filter are included in this condensing unit. Pressure vessel completed with either pressure relief valve or fusible plug operates in a maximum of 250 psig pressure. It can handle the increasing pressure inside the vessel and can alleviate the excessive pressure by lowering it automatically. Also, a Hi-Low automatic reset signal acts as a key operator for changes in pressure levels of heat.